It's possible to apply skunk odor remedies without putting your cat in a tub of water, but you'll still have to rinse her off -- and without a bath, the results won't be as effective. That said, a mixture of 3 percent hydrogen peroxide, baking soda and liquid soap works better than other home remedies. Check your cat for wounds and contact your veterinarian if skunk spray has gotten in her eyes or mouth. As bad as the smell is, skunk spray usually won't cause lasting harm. 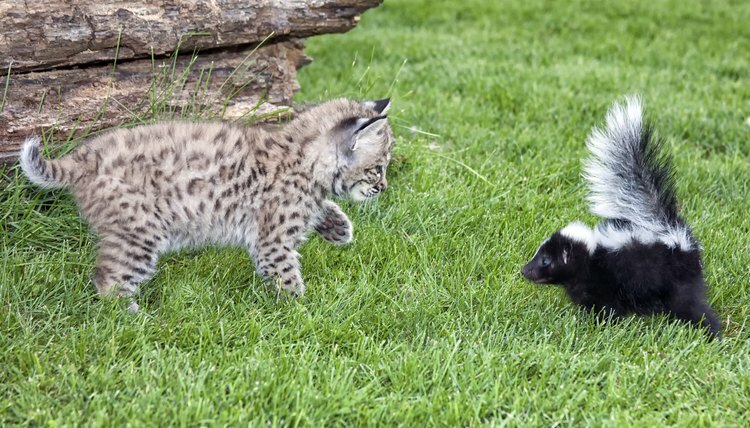 Skunk spray irritates eyes and mucous membranes, and might make a cat throw up or retch. If she continues vomiting or retching after you clean off the skunk spray, call your vet. Rinse her eyes with plain water or sterile saline solution if her eyes are watering. Although it's very rare, the thiols in skunk spray can damage red blood cells and result in anemia; that's a good reason to remove the skunk spray as quickly and thoroughly as possible. A more common serious concern is the possibility of injury from a skunk encounter. Put on gloves and carefully check your cat's body for wounds. If you find bite marks, call your vet. Skunks can carry rabies. Unless you have quick access to a commercial skunk odor remover, your best option is a home remedy that breaks down the chemicals in skunk spray. A chemist named Paul Krebaum invented a simple solution that oxidizes thiols, the compounds that cause skunk odor. Mix 2 cups fresh of 3 percent hydrogen peroxide, an eighth of a cup of baking soda and a half-teaspoon of liquid dish soap and apply it to your pet right away. The interaction between the ingredients breaks down the stinky chemicals, so it works only right after it's mixed. Don't store it -- the container could explode. Wet your cat's coat. Saturate a rag or paper towels to apply the water if you want to try to deskunk her without putting her in a bath. Apply the hydrogen peroxide mixture to the skunk-sprayed areas of the cat. Don't put it on her face. Rinse away the mixture thoroughly with lukewarm water within three to five minutes. Hydrogen peroxide can cause bleaching and may change the color of your cat's coat. If the odor still lingers, apply the mixture again. This is an emergency measure for removing skunk odor. Hydrogen peroxide is too harsh to use regularly on a cat. Commercial remedies, such as Skunk Kleen, Skunk Off and Nature's Remedy, should be rinsed off thoroughly. Tomato juice isn't very good at removing skunk odor. It usually requires repeated applications, which amounts to even more mess and annoyance for you and your cat than a bath. Never use detergents, bleach, disinfectants, deodorizers, fragrances or any product that contains essential oils on your pet. Human and dog shampoos may contain ingredients that harm cats. Cats are vulnerable to contact poisoning, meaning that absorbing chemicals or toxins through their skin can harm them. Consider getting expert help from your vet or groomer to remove skunk odor. Instead of risking cat scratches and an unpleasant experience for you and your cat by attempting to remove skunk spray without washing her, check with local groomers. Groomers are familiar with cleaning cats who don't like to be cleaned; a mobile groomer will spare you having to transport a skunked cat in your vehicle.